The Brits have a far more sophisticated potato chip culture than us Yanks. This is not some big revelation. One rationale is that the English are far more open to meats and seafood flavors in non-meat and seafood forms. Take snacks. Beef steak is the most American of proteins, and yet there’s virtually no steak-flavored chips stateside while it’s ubiquitous on U.K. store shelves. So goes British crisps with prawn cocktail, roast chicken, and smoky bacon flavors. Taken to the extreme—at least by our resistant American standards—is haggis-flavored chips, offered by Scottish crisp purveyors Mackie’s of Scotland. Haggis, of course, is a national treasure to Scots, but to outsiders it’s a dish more suited for Fear Factor. Generously labeled as a “pudding,” haggis involves a variety of sheep offal—such as heart, liver, and lungs—mixed with oatmeal, suet, and onions. All this gets wrapped inside a sheep’s stomach and boiled. (It’s illegal, in fact, to import true haggis to the U.S. because of a U.S.D.A. ban on lung.) Blanch all you want—the Scots dearly love their haggis, evidently with enough demand to turn it to a potato chip flavor. 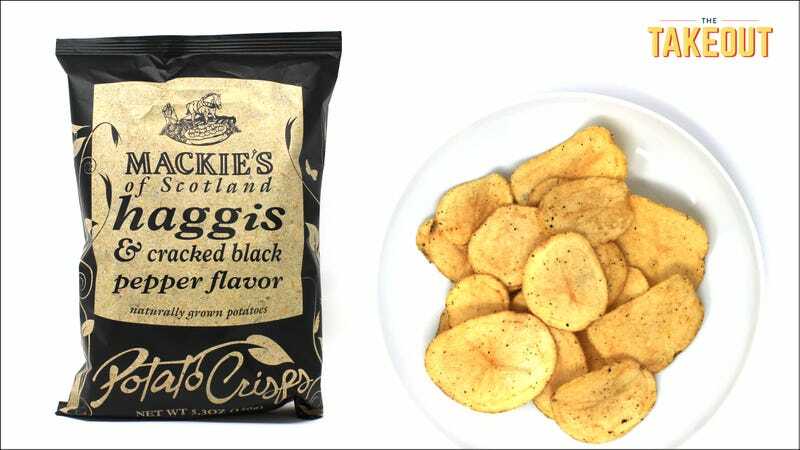 I saw Mackie’s haggis-flavored chips at a Chicago-area delicatessen that stocks select novelty snacks. I can’t imagine American demand for haggis chips are high. But as curios go (read: Instagram), it sufficiently grabbed my attention to pony up $6 for these Scottish chips (still cheaper than the $8-plus price tag on Amazon). No, it doesn’t taste like lungs, heart, nor liver. No gaminess can be detected. 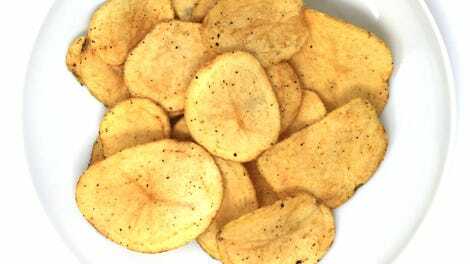 The flavor is of a proper, savory British chip—that beefy, yeasty, umami flavor prevalent in Walkers’ beef and onion crisps (in fact, the ingredient list notes there is “natural pork flavoring”). The secondary taste if of cracked black pepper—lots of it—and somewhere in the distance, the barest hint of sweet spice from oatmeal. There’s also something vaguely Swedish meatballs going on; I detected some nutmeg, mace, and allspice. It’s like 80 percent of its way to IKEA meatballs and gravy. As for the chips themselves, they’re thick-cut and flat, fried in sunflower oil. I’d almost like my chips slightly greasier. Nevertheless, it feels luxurious and sturdy in the hands—a pressed and starched Oxford shirt to an American chip’s T-shirt. I know $6 is a lot to pony up for chips, but I’m tempted to say I got what I paid for.